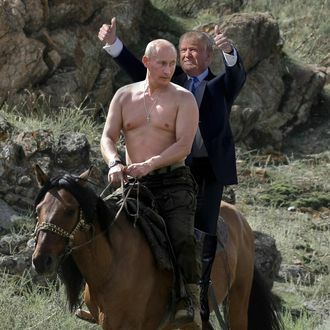 Donald Trump has admitted in the past that he’s a bit of a Vladimir Putin fanboy. He has given the Russian president an A for leadership and said he thinks they’d probably “get along pretty well” if they met. But until Thursday it was just a one-sided bromance. Now it seems the feeling is mutual. At his official end-of-the-year press conference, the Russian leader talked about everything from the Russian economy (he predicts growth next year and the year after that) and the recent close calls with Turkey in Syria (“The Turks decided to lick the Americans in a certain place.”) to ousted FIFA president Sepp Blatter (“He is the one who must be awarded the Nobel Peace Prize”). He also weighed in on the U.S. presidential race and had only nice things to say about candidate Trump. Trump called in to Morning Joe Friday, and hosts Mika Brzezinski and Joe Scarborough followed up with the GOP candidate about Putin’s comments. At least candidate emeritus Mitt Romney stepped in to clear things up.